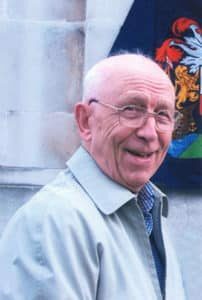 Jack Candy, who died aged 95 in 2017, was a long-standing member and supporter of the OSS, serving as our Southampton local correspondent from 1999 to 2012. With his wife Irene, he was a champion of community heritage and open spaces in Southampton. Jack generously left us the residue of his estate, for the establishment of a fund in memory of Irene and Jack Candy, to be used for the general charitable purposes of the society but not to be expended on administrative expenses. This has enabled us to appoint Frances Kerner as our commons re-registration officer, researching lost commons for registration before the cut-off in December 2020, starting in Blackburn with Darwen and Lancashire. Born in Swaythling in Southampton in 1921, Jack Candy started work at the age of 14 as an apprentice toolmaker in the works in Woolston which produced the Spitfire fighter. Along with hundreds of other Sotonians, he continued to play his part in the production of Spitfires throughout the height of the Blitz. After the war, he moved to Follands, then De Havillands and in 1961 into the fast-growing computing industry, at IBM in Hursley. Jack was elected city councillor for Sholing Ward in 1971. He served in this role for 17 years, becoming the 764th Mayor of Southampton in 1986, following the 762nd mayorality of his wife Irene. Jack and Irene shared a strong sense of community, and this was the foundation of a long and happy marriage, with four children, four grandchildren and one great grandson. Jack championed Southampton causes and assisted fellow citizens successfully to navigate local authority procedures long after he ceased to be a councillor. The City of Southampton Society (COSS) and the Society for the Protection of the Parks and Open Spaces of Southampton (SCAPPS) benefited enormously from his determination and tireless activity to safeguard the heritage and environment of the city. Singlehandedly, Jack raised over £70,000 for the construction of the Queen’s Peace Fountain in Andrews Park in the city centre, which was completed in 2001. Sadly, Irene did not live to see it finished. The fountain was the location of a memorial ceremony of Jack’s life on 1 September 2017. The Mayor of Southampton spoke of Jack’s many years of notable civic activity; his daughter Fiona, revealed the skilled chorister, craftsman, family man, and poet; Arthur Jeffery, chair of COSS and SCAPPS, reminded everyone of Jack’s considerable achievements in protecting public open spaces. A section of Southampton Choral Society provided live music for the event. We are pleased that Jack’s name lives on, both in and around Southampton, and within the Open Spaces Society as we strive to rescue those lost commons for public enjoyment.